At the very top of the short list of second generation San Francisco rock bands stands Journey, with over 43 million records sold in the U.S. alone, the only Bay Area group whose 30 years of music has truly stood the test of time. 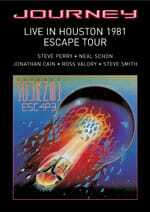 Now, the two-disc DVD-plus-CD collector's edition of LIVE IN HOUSTON 1981 – ESCAPE TOUR is set to arrive in stores November 15 th on Columbia/Legacy, a division of SONY BMG MUSIC ENTERTAINMENT. The two-disc package is a first for Legacy – presenting video and audio versions of this LIVE 75-minute performance – with the DVD and CD completely remixed in Stereo and 5.1 Surround by Allen Sides and remastered by Bob Ludwig. The Stereo CD version of the concert includes all the above performances plus a bonus track that wasn't filmed, “The Party's Over (Hopelessly In Love),” which originally was a studio version they had released earlier in 1981, as the single from the live double-LP, Captured. A lavish 16-page full-color booklet is packed with rare photography of Journey, tour memorabilia, and other surprises. The DVD has interviews with the band and a slide show of rare photos. The entire project was produced by former lead vocalist Steve Perry, with the full cooperation of the band. Five of the live performances from this historic MTV concert have been released prior to now: “Open Arms,” “Who's Cryin' Now,” “Don't Stop Believin'” (three of the hit singles from Journey's then-current 9x-platinum Escape album), “Stone In Love,” and “Anyway You Want It.” The balance of the tracks, include such Journey touchstones as “Wheel In The Sky,” “Lights,” “Lovin', Touchin', Squeezin',” “Mother, Father,” “Line Of Fire,” and the title track from the Escape album, which are LIVE and all previously unreleased. They make their debut on this special package – premiering the concert in its entirety for the first time ever. Their seventh studio album, the all-time best-selling Escape, was co-produced by former engineer Mike Stone (known for his studio work with Queen, Kiss, and others) and Kevin Elson. The album was released the first week of August 1981, coinciding with MTV's historic sign-on of 12:01 a.m., August 1 st . Escape was pumped up by the summer take-off single, the top 5 “Who's Crying Now,” which earned the band a prestigious spot opening for the Rolling Stones at JFK Stadium in Philadelphia on September 12th – the same date that Escape hit #1. The album was still inside the top 20 two months later, when Journey rolled into Houston and MTV, still in diapers, decided to broadcast the concert. 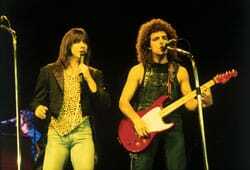 In fact, as Journey stayed on the road well into 1982, and the next three singles all ran up the charts (“Don't Stop Believin',” “Open Arms,” “Still They Ride”) through the following summer, Escape stayed in the top 20 for over a year. In all, the LP logged nearly three years (146 weeks) on the chart, on its way to 9x-platinum. The Journey saga carried on for another five years in the '80s, with the Frontiers album in 1983 (6x-platinum, with the top 10 “Separate Ways (Worlds Apart)”); and 1986's Raised On Radio (double-platinum, with “Be Good To Yourself”). Despite the fact that they swept the annual BAMmies (Bay Area Music Awards) in 1987, a disbanded Journey's members went their separate ways. A decade of outside projects began, as Schon and Cain formed Bad English with John Waite, and Perry resumed his solo work. On May 8th of 1998, Steve Perry and Journey officially went their separate ways. Lineup : Steve Perry (lead vocals); Neal Schon (lead guitar, vocals); Jonathan Cain (keyboards, vocals); Ross Valory (bass, vocals); Steve Smith (drums). Note : All tracks previously unreleased, except (*) indicates previously released.